At the risk of sounding like a broken record, I am going to write again about whether Canada is, was or will be experiencing a recession. You may wonder why I am doing this. After all, on December 1 the authoritative Peter Mansbridge, anchor of the CBC National news pronounced that the recession is "officially over", citing the report from Statistics Canada that real GDP grew 0.6% (or 2.3% at an annual rate) in 3Q15 after contracting modestly in the previous two quarters. According to this interpretation, the so-called "technical recession" meaning two (or more) consecutive quarters of negative real GDP growth, a definition widely adopted by the general media and the business press, was over. However, I have recently joined the C.D. Howe Institute's Business Cycle Committee (BCC), which is described on the Institute's web site as "an arbiter of business cycle dates in Canada.... The Council performs a similar function to the National Bureau of Economic Research (NBER) Business Cycle Dating Committee in the United States." This is a big responsibility and one that I take very seriously. When I told my wife about it, she was puzzled, and asked why I would want to spend my time on such an activity. She correctly pointed out that most people are more interested in what will happen in the future than in having precise dates upon which the economy entered into and exited from recessions. I explained that economists can do a better job giving guidance about the future direction of the economy if they understand the causes and dynamics of past business cycles. I was not a member of the BCC when it issued its latest report, which concluded that "as of July 22, data did not provide evidence that Canada had entered an economic downturn", but said it would review its position later in 2015. A recession is the phase of the business cycle when aggregate economic activity is contracting.... The drop in economic activity is a self-reinforcing process, where lower incomes lead to cuts in spending, which trigger declines in output and possibly employment, which lead to further reductions in incomes. A significant decline in activity spread across the economy, lasting more than a few months, visible in industrial production, employment, real income, and wholesale-retail trade. What these definitions have in common is that they require a "significant" contraction of economic activity, measured in four key dimensions: real output, employment, real income, and real spending or sales. To qualify as "significant", a contraction must meet the 3 P's test: it must be pronounced, pervasive, and persistent. To be pronounced, the contraction must show some depth or amplitude. To be pervasive, it must demonstrate some duration or length. To be persistent, it must show scope or breadth across the key dimensions of output, employment, real income and spending. Although one can use these considerations as guides in identifying and dating recessions, it is worth emphasizing that it is impractical to establish preset conditions with respect to amplitude, duration, and scope because these considerations need to be judged simultaneously and because the economy and its measurement change over time. Thus, the [business cycle] chronology we present ... is the result of a careful balancing of these different considerations. It should be clear from this discussion that Peter Mansbridge and other media commentators were not referring to any rigorous definition of recession when they pronounced that the recession is "officially over". Indeed, it may not yet be possible to determine whether a recession "officially began" sometime in the first half of 2015, because professional judgement has not yet been made on whether it was pronounced, pervasive and persistent enough to qualify as a recession. In the excellent work on dating recessions back to 1926 done so far by the C.D. Howe Institute's Business Cycle Council, I have one fundamental problem. Of the four key dimensions of economic activity that are key to dating a recession, the BCC has only analyzed two: real output and employment. The reason for this seems to be that Canada lacks monthly data on real sales and real income. In the United States, the NBER does not give any significant weight to quarterly real GDP in dating recessions. It relies on monthly data for industrial production, non-farm business payrolls, real personal income, and real manufacturing and trade sales. In Canada, we have monthly data on real GDP for both the private and public sectors and monthly data on employment by industry. Statistics Canada does not produce monthly data for real income or for real sales. First, are we attempting the measure and date the "business cycle" or some broader measure of the "economic cycle" comprising both the private business sector and the public sector? It is well known that the business sector is more cyclical than the broad economy which includes the public sector. I believe that it is the business sector that is most prone to cyclical dynamics and that this should be the focus of dating business cycles rather than the total economy. That means we should focus on measures of private sector output and employment, not measures of total real GDP and total employment. Thus, it would be possible to have a business cycle recession without experiencing a significant decline in total real output or employment. Second, in the absence of monthly data for real income, should we not include a focus on quarterly real income measures, which Statistics Canada does produce? The quarterly national income and expenditure accounts provides both measures of output, real gross domestic product (GDP) and real gross domestic income (GDI). Using measures of real income from the quarterly national accounts allows us to move toward a "made-in-Canada" definition of the business cycle. Canada's economy is different from the US economy. Canada is a smaller, more trade dependent and more resource dependent economy than is the United States. This means that Canada's prosperity is more dependent on movements in the terms of trade (the price of its exports relative to its imports) and the exchange rate. The effects of these movements can introduce quite different behaviour in real GDI than in real GDP. As I have argued in a previous post, looking only at real output, measured by real GDP, often misses the point, especially when there are large movements in the terms of trade and the exchange rate, as has been the case in 2014-15. A brilliant exposition of this thinking is contained in a Statistics Canada publication which I just recently stumbled upon. The 2012 study, "Natural Resources, the Terms of Trade, and Real Income Growth in Canada: 1870 to 2010", by John R. Baldwin and Ryan Macdonald, provides a rich account of the historical development of Canada's natural resources. In addition, using annual data, it measures the contributions to real income growth arising from real output growth, terms of trade shifts and exchange rate movements. It demonstrated that over the 140 year period, real income grew substantially more than real output because over that long period of time, terms of trade and real exchange rate effects added to real income growth. Recent changes to the presentation of the quarterly national income and expenditure accounts make the same information available on a quarterly basis back to 1981. It seems feasible that such quarterly data could be calculated at least back to 1946. The chart below shows drawdowns from quarterly peaks in real GDP and real GDI since 1981. The drawdown is the cumulative % decline from the previous peak level. In recent recessions, in 2000-01 and 2008-09, notice that the cumulative declines in real GDI were both larger and more protracted than the declines in real GDP. This is because, the price of commodities produced in Canada fell quite sharply and the terms of trade weakened significantly. In the most recent period, real GDP fell only modestly, by just a cumulative 0.24% over the first and second quarters of 2015, but real GDI, fell for the three consecutive quarters to 3Q15 and by a much larger 1.5%. Since the terms of trade are continuing to decline in 4Q15, this story is still unfolding and it is possible that the downturn in real GDI could deepen further. it is persistent, in that quarterly GDI declined for three consecutive quarters, monthly GDP declined for six of the nine months months from January through September and remained well below the December 2014 peak level. For this reason, I believe that, based on current evidence, a recession probably did begin in early 2015. 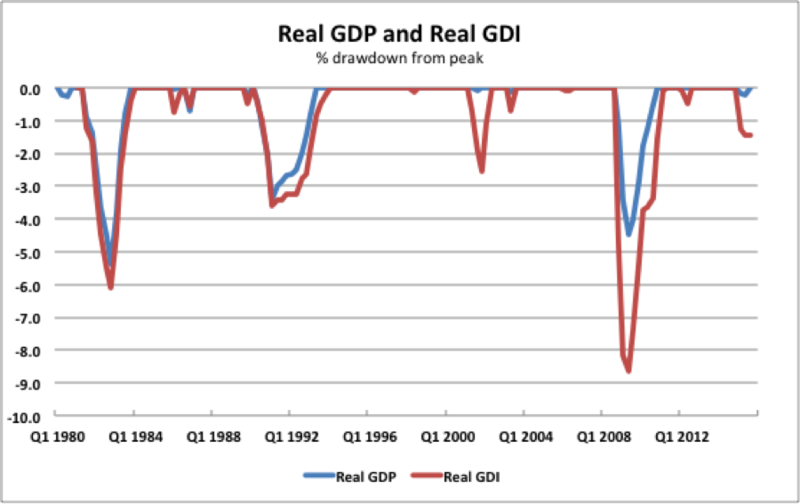 I also think that it was a more serious recession than indicated by the decline in real GDP. However, I do not believe that a definitive conclusion can yet be reached on dating the beginning and the end of the recession. Unfortunately, this nuanced conclusion is unlikely to ever be reported by Peter Mansbridge on The National. You are definitely onto something significant. I would suggest that you go further and look at nominal incomes. Economists obsession with the real side makes sense in a world inflation, certainly if inflation is at the long term levels of 2-3%. But with so many deflationary factors hitting the producers that in some instances while sales volumes are up, sales income is stagnant or even down. Retailers can attest to this affecting their business profitability; and by extension to total national ( nominal ) incomes. And nominal incomes are at the heart of the debates about inequality, not real incomes. Thanks for the comment. I agree that we need to keep a close eye on nominal incomes. After a sharp decline in 1Q15, nominal GDP was up just 0.4% y/y in 3Q15, weaker than in many recessions. Thank for you this very insightful contribution to a hotly debated topic among Canadian economists. It would seem that both Meteorology/Climate Science and Economics struggle with predictions, even with identifying which factors are important. This sounds so much like groping for a definition of 'drought' or 'warming'. Thanks for the comment. I agree that economists and climatologists struggle with predictions. For me, this is why we should treat predictions with great caution and hedge against seriously bad outcomes.